Cruise lines must now abide by North America’s clean fuel regulations, but will they? Will the cruise industry continue to argue the EPA or refocus their energy on affording the cleaner fuel and finding fuel-efficient alternatives, a move that in the long run will benefit the seas they sail in? A long-planned environmental regulation requiring ships to use cleaner, low-sulfur fuel while operating near the North American coast took effect on Wednesday, despite concerns that suppliers may not be ready. The North American Emissions Control Area (ECA) will see the world’s top oil consumer join other regions like the European Union in imposing sulfur limits on marine fuel, typically the most polluting of all oil products. The ECA sets a cap at just 1 percent sulfur within 200 miles of the coast versus a 3 percent standard in the past. 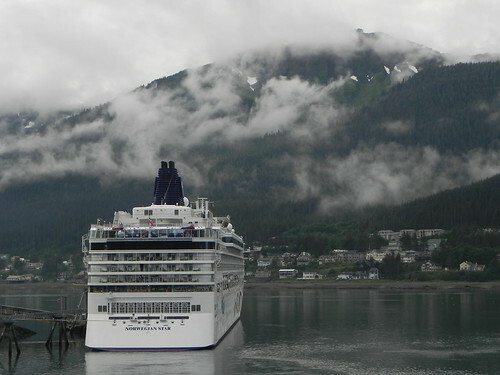 Norwegian Star cruise ship in Juneau, Alaska. Photo by Yosemite James. The shipping industry says the new norms may cause a sharp rise in prices as refiners pass on the higher cost of producing cleaner fuel. Some worry that not all will be prepared. “We’ll know in a couple of weeks or a month whether (availability) will be an issue,” said Chris Koch, president of the World Shipping Council, a trade association based in Washington, D.C. and Brussels, that represents the global liner shipping sector of container ships and car carriers. The Environmental Protection Agency, which will regulate the program, said in its initial rule published over two years ago that the overall cost of the scheme would come to $3.2 billion by 2020. The Office of Transportation and Air Quality said it will prevent as many as 14,000 premature deaths by reducing nitrogen oxides, sulfur oxides and fine particulate matter. The United States consumed about 500,000 barrels a day (bpd) of bunker fuel in 2010, accounting for less than 3 percent of the country’s total oil use, according to government data. Some 390,000 bpd of that was fuel oil, mostly higher-sulfur. Refiners have already invested billions in new equipment to reduce production of low-margin residual fuel, demand for which has nearly halved over the past decade as power plants, industrial users and even households cut back in the face of rising oil prices and tougher environmental requirements. Ships now account for some three-quarters of all U.S. fuel oil use. Refiners will now need to work even harder to strip more sulfur out of the residual fuel, causing prices to rise. Koch said the price of low-sulfur fuel might up the cost of fuel by $60 to $90 a tonne, depending on the port. The cruise ship industry has proposed alternatives to more costly low-sulfur fuel that include innovative exhaust scrubbers, using alternative energy sources such as shore power in port, adjusting ship speeds, and averaging based on air quality effects on population, according to a July statement by the International Cruise Lines Industry Association. The state of Alaska has fiercely objected to the new emissions controls, filing a lawsuit in July against the Obama Administration to block enforcement in Alaskan waters, arguing that higher costs of shipping will hurt the state’s cruise ship tourism and economy as a whole. “Increased regulation of these vessels increases the costs of bringing goods to Alaska, in effect operating as a tax on all Alaskans,” according to the lawsuit. Alaska officials argue in the lawsuit that the agreement on shipping emissions-control between the United States and Canada is an unlawful treaty, according to court documents. They also argue that there was no scientific basis for extending it to Alaska since the EPA’s air-quality modeling extends only to the Lower 48 states, the documents show. The specifications tighten again in 2015 to just 0.1 percent sulfur, a level that Oceanox — a company that sells special equipment called scrubbers that reduce sulfur in shipping fuel — says will render fuel oil all but obsolete. “This change will necessitate vessels either switching to marine gasoil or modifying engines to consume LNG or installing post combustion exhaust gas cleaning equipment,” it says. Editing By Jonathan Leff and Andrew Hay.